Campaigners fighting high-rise flats in Hove are inviting people to have their say on a neighbourhood plan. Neighbours in the Davigdor Road area fighting tall buildings on the former Hyde Housing Association site and in Lyons Close, have set up Hove Gold through the Hove Housing Futures Facebook group. They are holding a public meeting at St Luke’s Church in Old Shoreham Road, to encourage people to share their ideas and visions for the area which includes St Ann’s Well Gardens. Hove Gold as a group is concerned about the size of blocks, which range from five to nine storeys, proposed for the area claiming people do not want to live in them. An example the group describes as a failure is the Artisan block on Davigdor Road which is still almost empty a year after it was built. The flats began to be marketed last October. The block was sold by Crest Nicholson to Southern Housing Association but campaigners describe the flats as too expensive for local families and unwanted by those that can afford them. Campaigner Sam Goult hopes creating a neighbourhood plan will help to build on the family-focused community. He said: “The Lyons Close site could be used to create genuine family housing which people want to live in. “The eight-storey Artisan block is a perfect live test case that clearly isn’t working, but developers are about to copy-and-paste this tower-block five times. “The definition of insanity is repeating the same thing and expecting a different result. There are currently 110 objections to the Lyons Close development (ref BH2018/01738) on Brighton and Hove City Council’s website and 27 against the Davigdor Road plans (ref BH2018/02926). Mr Goult wants people to speak out against more tower blocks in Hove, describing some as eyesores from the 1970s. 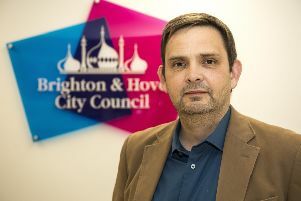 He said: “The Hove Gold Neighbourhood Plan is to ensure that local residents get the chance to be heard and be the custodians of Hove’s character before it’s lost forever to a quick profit. Goldsmid ward councillor Jackie O’Quinn is backing the campaigners even though she is a member of the council’s planning committee. When the Lyons Close and Davigdor Road applications come before the committee, if she is still a sitting councillor, she will have to leave the room. She said she is delighted people are taking a stand as she hopes it will encourage more people to get involved and make a difference. Councillor O’Quinn said: “It is very exciting. I think it will be hugely successful because people are very frustrated by so much development. The meeting starts at 7.30pm on Wednesday (February 20) at St Luke’s Church, on the corner of Old Shoreham Road and Stanford Road.